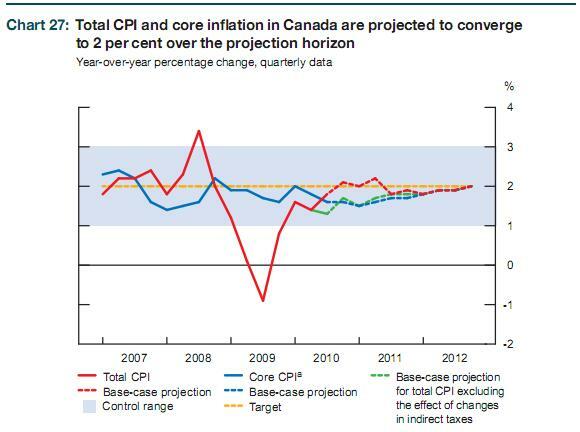 Bank of Canada Inflation Predictions. Stay Calm, Confident, Stable and Predictable. The Bank of Canada (BoC) announced recently that core inflation is now 1.4%. If you are confused on the differences between core and CPI inflation please do a search here on the site as we have covered the topic a number of times. Although this was a huge jump from the previous level of about 0.5% it is still below the target rate of 2%. 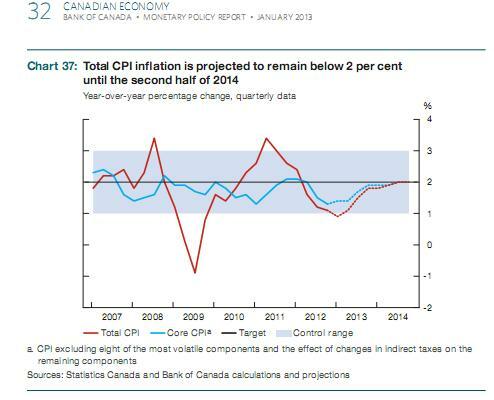 Today we will examine how the BoC sees inflation in their models. It is tough describe the details of an economic model in a blog post without quickly boring a reader to death. I will do my best to stay as vague as possible so please stick with me for a least a paragraph or two. The BoC uses a model called ToTEM. If you want the exact details you can read about it here. This type of model is called (do not let this scare you off) a Dynamic Stochastic General Equilibrium or DSGE. The main idea here is that you have a series of agents in an economy. Individuals, businesses, banks, government etc. are each considered an agent. You then set rules for each, express them as a mathematical formulas and then combine them all into one huge model. All the equations are related to each other. So if banks decide to raise interest rates, for example, people will save more and businesses will borrow less. It can get extremely complex and there are specialized software packages designed to handle this type of thing. The idea is that you can feed in data from the real world up to the current date and then tell the computer to “predict” how things will look in the future. The weakness of this type of model is the assumption that there is an equilibrium steady state of an economy; a happy set of conditions where everything exists in a nice steady value and nothing terrible is happening. GDP grows at the same percentage every year, demand is steady, interest rates and exchange rates remain unchanged and inflation remains at our nice comfortable target of 2%. This assumption is so strong that anytime things are outside these nice comfortable values the math in the model is designed to push everything back into place. The problem is that the real world is never in the happy state. The model sees that the world is outside of its steady state and predicts that everything will eventually move back into its equilibrium (or happy place) eventually. Still with me? Good. Inflation is our main topic here, let’s get back to it. BoC releases a quarterly Monetary Policy Report (MPR), we have looked at them a few times in the past. As part of this report they outline the current state of the economy and current inflation levels. If Canada is not at the 2% target the MPR discusses how long it will be before we get back to it; the assumption is that we will always get back to it. The BoC would never talk about specific future interest rate changes in any of their reports. This means that any predictions (or forecasts if you like that word) made in these MPRs assume that the current interest rate remains constant. I think we should take a look at the most recent MPR to see what it says. This one is January 2013. We see that, according to the model, inflation should return to a nice steady 2% by mid 2014. After seeing that graph you have most assuredly been instilled with confidence and a sense of stability. The BoC is glad, because that is the purpose of this type of report. The story was very similar is the October 2012 MPR. Just wait until 2014 and inflation will be back to 2%. Rejoice. Citizens of Canada in October 2011 felt confident and stable as well. Their inflation was going to return to 2% by the end of 2013. 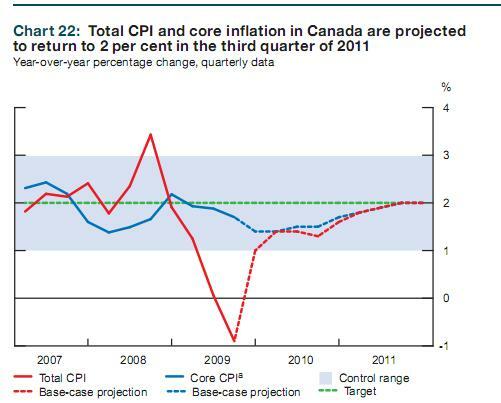 In October 2010 our confidence came from knowing that inflation was definitely going to be back to 2% by the end of 2012. 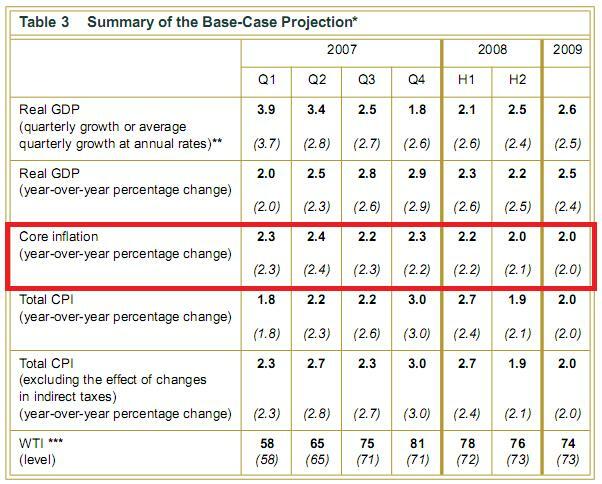 Everyone in October 2009 knew that even though inflation was not quite on target, by 2011 it would be right where it needs to be. 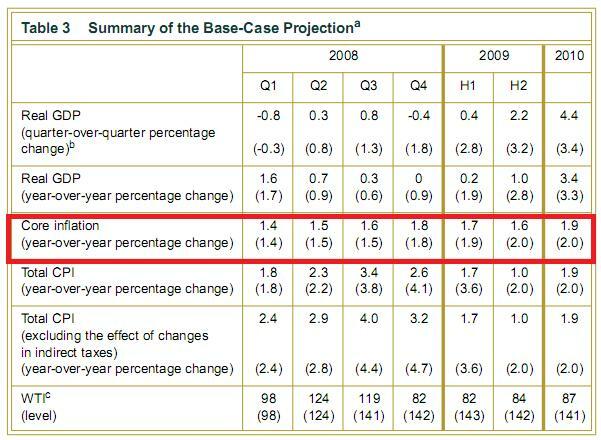 In October 2008 people were so confident that inflation would return to the 2% target they did not even need graphs, they made due with tables. Everything would be okay by 2010. In October 2007 things were different. We had too much inflation. Never fear, the math works in both directions. Things would be back to normal by the end of 2008. 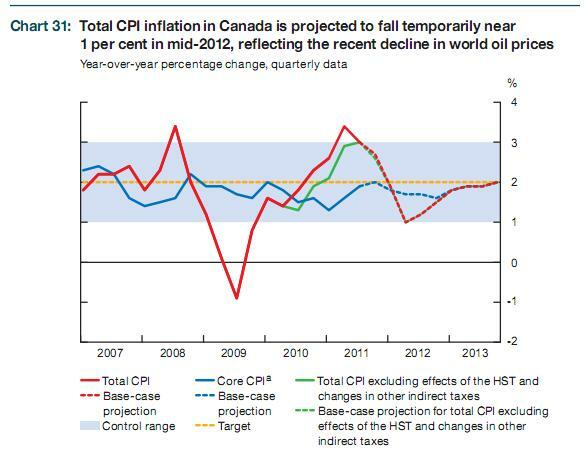 Strangely, the more reassuring Bank of Canada inflation reports that you read, the less reassured you feel. Even with this brief look at a complex topic the hope is that you when you hear “predictions” about the state of the economy you now understand how some of them are made. If nothing else, when the topic comes up in conversation you can amaze your friends and co-workers by predicting what the inflation forecast will look like in the next MPR, before it is released.